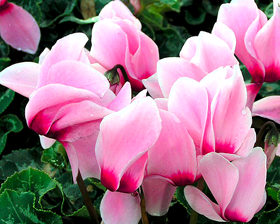 One of the easiest Cyclamen to grow, as it is very forgiving if grown in less than ideal conditions. Rosemarie makes a beautiful bright accent to display indoors during its mid-winter blooming season. Delicate pink shades colored flowers with wine red eye bloom from upright stems growing from the center of the plant. Soak seed in warm water for 12 hours before sowing. Sow from July to March. Sow on the surface of lightly firmed, moist seed compost in pots or trays. Cover seed with a fine sprinkling of compost or vermiculite. Keep at a temperature of between 10-15C, and place container in darkness. Keep the surface of the compost moist but not waterlogged; germination will usually take 1 to 2 months. Place in light conditions as soon as seedlings begin to appear.